Owing to our years of industry experience, we are offering a wide range of Circular Main drain. Offered filter plant is widely appreciated for its superior functionality and long lasting service life. This plant is assembled using the best grade components and modern technology in synchronization with the set industry standards. 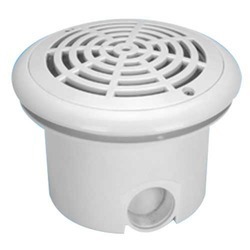 We are offering best main drain for swimming pool.We also supply other required accessories. 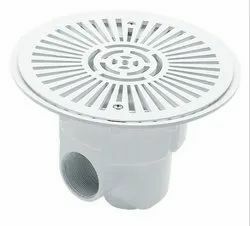 Main Drain manufactured in Stainless Steel AISI 304 / 316, On commercial or shallow pool applications stainless steel main drain grilles must be used. Matching up with the never ending demands of customers, we are engaged in offering Complete Main Drain, which is highly durable in nature. - Available in different sizes, flange, grid and cap in ABS. - 100% manufactured in ABS with extra protection against UV. - Highly resistant against all chemical products. Swimming Pool Main Drain is designed to prevent groundwater from intruding the pool. It is made with injection moulded ABS and has dome shaped cover. It can be casted at the floor of concrete Swimming Pools. - Vertical exit in 50 mm diameter (blocked) allowing a tube to be inserted for easier installation. - Side exit with 2" thread for easier installation and use of a male threaded fitting. - Reinforced flange and grid plat - automatic cleaners do not get stuck.